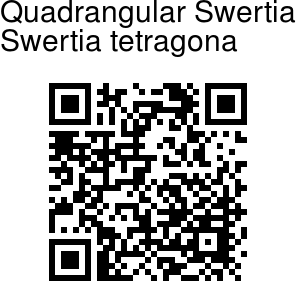 Quadrangular Swertia is an annual herb with stem 15-50 cm, simple or branched, quadrangular, finely winged or not. Leaves are 10-25 x 4-8 mm, narrowly ovate to obovate or ovate, pointed or blunt. Inflorescence paniculate, lax. Flowers pentamerous. Sepals 4-8 x 1-2 mm, narrowly ovate to obovate-oblong or linear, pointed, free. 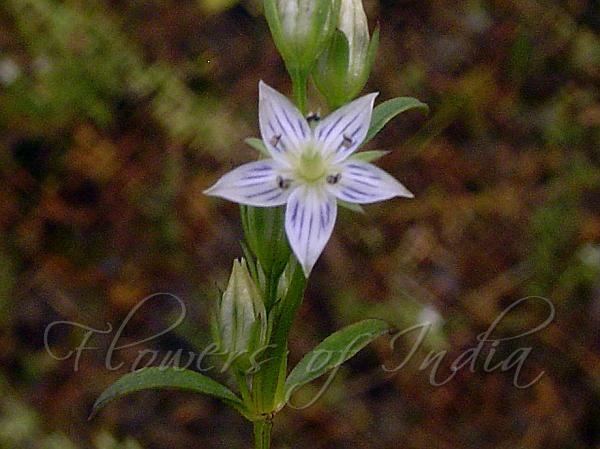 Flowers are bluish white to greenish white, tube 1-1.5 mm, petals 4-8 x 1.5-2.5 mm, ovate, pointed. Glands are two per lobe, oblong, fringed. Filaments are 3-4 mm, thread-like, anther ovate, blunt. Ovary 5-6 mm, oblong stigmas nearly round, stalkless. Capsule is 6-10 mm. Seeds rounded, warted. Quadrangular Swertia is found in the Himalayas, from Pakistan to Nepal, at altitudes of 2400-3300 m. Flowering: August-October. Identification credit: Krishan Lal Photographed in Great Himalayan National Park, Himachal Pradesh.